Flick by Spark of Madness, shown here with the 2 extra replacement tokens. From 6th to 8th grade I attended a slightly overcrowded school. This school didn’t lack in resources but it did have a hard time getting buses in and out so the afternoon release was broken into two loads. I was second load which meant that I had 15 to 20 minutes of free time each afternoon to sit and talk with friends. What did we usually do? We played paper football, of course! I didn’t consider it at the time, but the game was perfect for us because it was portable, had zero setup time (someone ALWAYS had a football ready), and you could end the game at a moment’s notice. Or you could make a note of the current score and finish the match the next day. I hope I’m making you nostalgic because I’m certainly doing it to myself! You play Flick similarly to the way you play paper football. Only instead of a football you have three tokens and you must get one of them in your opponent’s goal. At the start of the game, each opponent takes their three tokens and “rolls” them onto the table. Reroll any that are stacked. Any that are over the table’s mid-line (in your opponent’s territory) are tossed back into play by your opponent. If all of your tokens are face down then you have “bombed” and your opponent gets a free Flick. Form as a round a circle with your arms as you can and let your opponent try to flick a token in. If it succeeds then the opponent scores 3 points. If you both bomb then they cancel one another out. Otherwise, start your offense (determine the first player with a coin toss). To advance a token you have to flick it between your two other tokens either sideways or with a forward movement. Flick a token into your opponent’s goal and score the points represented on the face of that token. 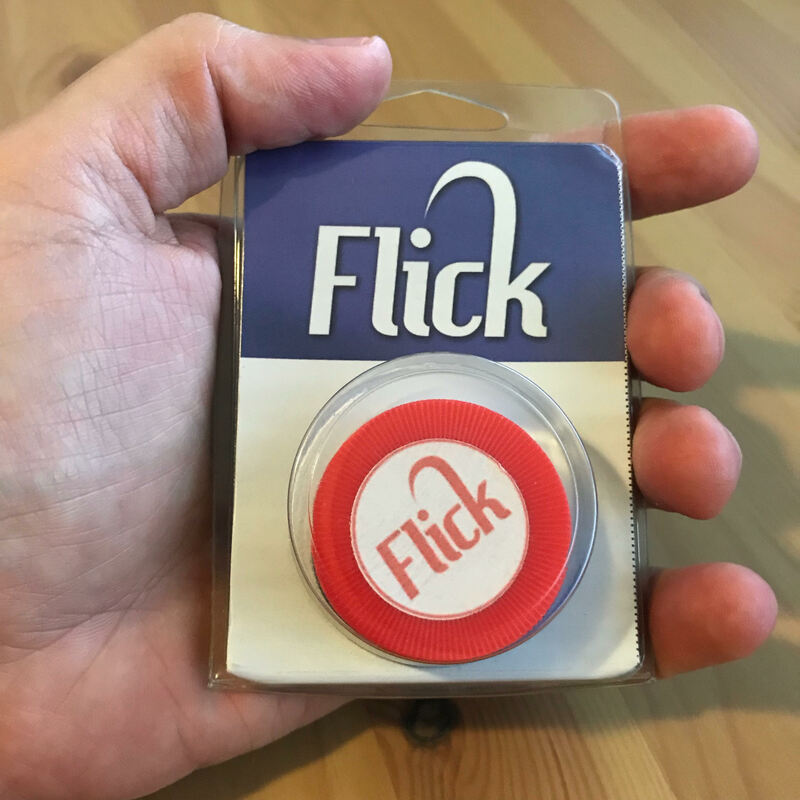 Either 1, 2, or 3 for the “Flick” token. It’s important that you realize that you can only score with face up tokens. So plan accordingly. If you score with a Flick token then you also get the opportunity to flick in the token as I described in the previous paragraph. If a token doesn’t move forward or horizontally then possession changes. Also, when a token falls off the table or doesn’t pass between your other two tokens then possession changes. The new offensive player decides to either continue play or to reroll. The first player to score 15 points wins. 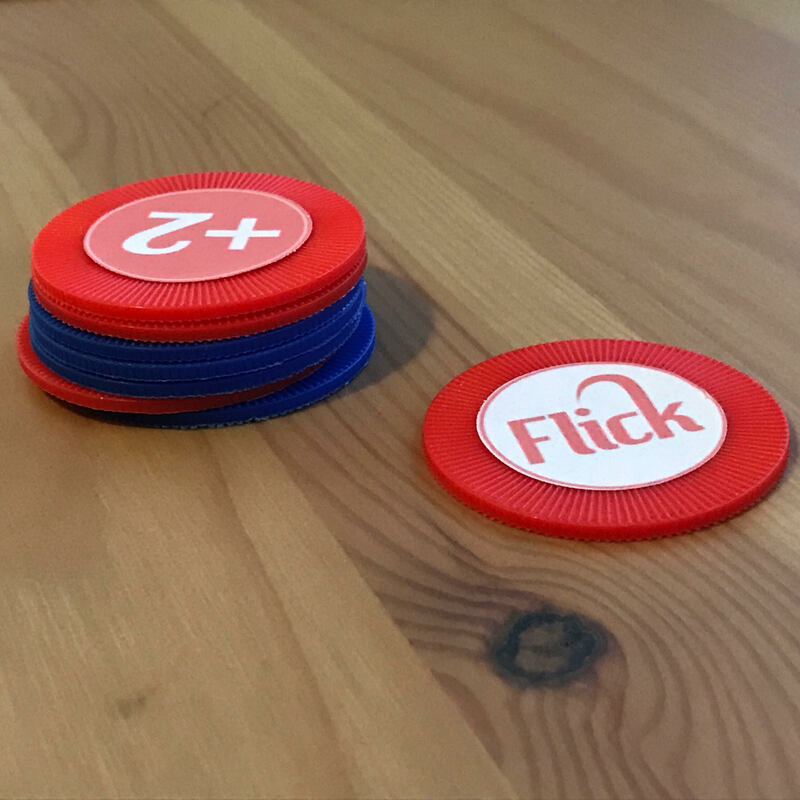 Flick by Spark of Madness capitalizes on a few key elements: portability, easy rules, and the ability to play on nearly any table. The game is small enough to fit in your pocket. In fact, if you’re comfortable enough with the rules you could just carry the tokens around with you instead of the entire package. The rules can be learned in 5 minutes and there is an entertaining video the creators made that also explains them. It may be more challenging to play on smaller tables but I’d say anything that is at least 4 feet should be good enough. My complaints about the game are not in its design or with player engagement. It comes down to component quality. The tokens are, in actuality, poker chips with stickers affixed to one side. Sadly for the creators, there is nothing stopping someone from simply learning these rules and then marking up their own poker chips and thereby having no need to pay $10 for the game. We had a lot of fun playing Flick and the friends I’ve mentioned it to have asked that I bring it the next time we meet up. There really is no reason I can’t do so. Thanks to Matt Boisvert for this review copy of Flick by Spark of Madness!